Verónica’s extensive experience in the field of human rights reflects her commitment to promoting competent criminal defence in Bolivia. Verónica received her law degree at the UCB Bolivian Catholic University graduating from the University of Chile’s Human Rights Center with a postgraduate degree in “Human Rights and Women” in 2009. Verónica currently works at the Universidad Franz Tamayo in La Paz as a Professor of Higher Education and Chair of the Labour Law and Human Rights Law Departments. 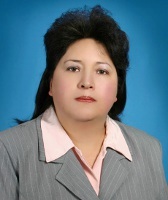 She has participated in numerous workshops and training sessions dedicated to addressing the discrimination and marginalization facing women within the Bolivian justice system. Bolivia’s new State Constitution and legal framework now explicitly include numerous promises to respect human rights, including the right to due process and competent legal representation. On account of the country’s high crime and poverty rates and the public defender offices’ lack of resources, there is a wide gap between the promises of the written law and the reality for Bolivian citizens. The status of Bolivian women within this already weak legal system is only exacerbated by existing cultural stereotypes. Because there are a limited number of public defense attorneys in Bolivia, men receive priority treatment in terms of access to defense. It is therefore difficult for Bolivian women to secure direct legal representation. This lack of counsel, combined with the overcrowded conditions of these prisons and the constraints on family interactions, often leave women helpless and struggling to overcome a complex network of poverty, discrimination, corruption, and bureaucracy. According to the Bolivian National Institute of Statistics, the proportion of Bolivia’s prison population who are women is the highest in South America. Female prisoners in Bolivia are frequently abandoned by their families due to the social stigma associated with female deviance and are often stigmatized and grossly mistreated within the criminal justice system. Furthermore, the conditions in the country’s 11 women’s penitentiary centres are deplorable. These centres were not originally built to house inmates, and do not meet the minimum standards of living conditions as defined in the regulations. Within these facilities, women face discrimination on several fronts, denied family visits, medical care, recreational, educational, and labour activities, and access to rehabilitation programs. The Project: In order to counter the gender-based discrimination experienced by many women within the Bolivian justice system, Verónica set out to provide free legal representation to women prisoners. With her $5,000 JusticeMakers Grant, Verónica provided gender and rights based legal defense trainings for local defense lawyers, organized human rights training sessions with prison authorities, and conducted a number of hearings on behalf of female prisoners. Verónica successfully transferred female drug addicts to rehabilitation centres and processed applications for parole for pregnant women who were in detention. As a direct result of Verónica’s work, 6 women were released from prison. Results: Among these women were Maria and Lydia, who were arrested for possessing two bags of stolen coca leaves that a friend had given them to dry. The sisters were held for 10 months, and had been in pre-trial detention for 4 months when Maria attended one of Verónica’s JusticeMakers workshops in prison. Before meeting Verónica, neither Maria nor Lydia understood that they had the right to a fair trial, the right to representation, or the right to timely execution of the law. With this newfound knowledge, Maria and Lydia obtained documents proving that they had families, homes, and jobs, and were consequently granted conditional release until their trial. With Verónica’s legal assistance, Maria and Lydia were able to await their trial at home with their children instead of in an overcrowded prison cell. Another one of Verónica’s clients, B.N., a rural immigrant woman accused of covering up the abuse of her eldest daughter by her partner, was remanded along with her five youngest children for 2 years without a trial. She had failed to report the incident out of fear of her partner, who was an extremely abusive man. Until B.N. met Verónica, she was unaware of her own rights as well as the rights of her children. In the workshops and educational sessions on women’s legal rights, Verónica included information on the constitutional rights of children. Verónica also directly worked with incarcerated children and was successful in securing the transfer of juvenile prisoners who were incarcerated unlawfully in the same facilities as adults to the appropriate juvenile facilities. Along with providing legal defense and rights information to women accused of crimes, Verónica produced a report on the suffering and discrimination faced by women detainees, in order to accurately convey their experiences in a criminal justice system that habitually favours men. Through this project Verónica fostered a group of criminal defense lawyers who understand the importance of assuring women’s human rights in Bolivia, thereby laying solid foundations for the progression of women’s, and juveniles’ rights within the Bolivian criminal justice system. Nonetheless, she is determined to build on this work in order to fully rectify the entrenched legal practices that currently violate the rights of female prisoners.